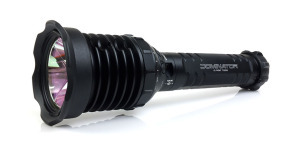 SureFire’s new E2D LED Defender Ultra is the latest addition to the Defender line of flashlights, boasting an increased output of 500 lumens focused by a Total Internal Reflection (TIR) lens. The Ultra, like its predecessor, the E2DL, provides two levels of output controlled by a single tail-cap switch: Press or click once for full output and return to off and press or click again within 2 seconds for a lower intensity 5 lumen output. 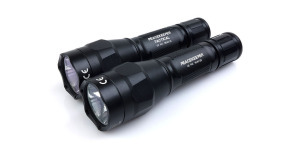 As with other SureFire Defender flashlights, the E2DL Ultra features a crenelated bezel and scalloped tail cap, both providing defensive options should the need arise. The E2DL Ultra has a high-strength aerospace aluminum body, with a Mil-Spec hard anodized finish in matte black. The Ultra’s MSRP is $265. One of the first things noticeable about the E2DL Ultra is that it is simply a great looking light. It is hard to beat a SureFire E-series light with the black hard-anodized finish, distinctive knurling, and crisp white lettering. The light is compact and lightweight but still feels solid with no obvious defects with regard to fit or finish. The knurling, finish, and scalloped tail cap provide for a secure grip on the Ultra in a variety of holds. As with the EB1, the batteries in the E2DL Ultra are supported by springs at both the head and the tail, possibly a nod toward use as a weapon mounted light. Also, the Ultra is the first two-celled E-series light to feature SureFire’s 2-way pocket clip previously found on the LX2 Lumamax and A2L Aviator. In contrast to other recent offerings from SureFire, the E2DL Ultra can be broken down into its component parts (head, body, and tail cap) which are interchangeable with those from earlier E-series lights. When I first saw the announcement for the E2DL Ultra, I was slightly concerned that the larger head would make the light too front-heavy. However, the Ultra is only slightly longer and heavier than the E2DL and remains balanced well enough for comfortable use. Although the head is larger than before, it’s not excessive and is approximately the same diameter as the EB1 and A2L heads. The addition of the 2-way pocket clip permits bezel down carry and it appears the E2DL Ultra bezel was designed with this in mind. Although it still features SureFire’s Strike Bezel design, the teeth are not quite as aggressive as on the E2DL and are slightly beveled, reducing snagging and clothing wear. After carrying it for a couple of days, I can say the Ultra slips in and out of my jeans pocket much easier than I expected. The SureFire V91 quick-detach holster can also be used to carry the E2DL Ultra in a bezel-up position. The real reason for interest in the E2DL Ultra isn’t due to its nice finish or new pocket clip, but instead due to its 500 lumen rated output, a whopping 150% increase over the E2DL. The result is an extremely versatile beam with a bright white center hotspot and plenty of surrounding light for peripheral vision. The beam exhibits some rings as a result of the TIR optic but these are only noticeable when shining the light on a nearby wall. There is a green tint to the corona around the hotspot similar to the EB1. Overall, the Ultra’s beam is very useful and almost surprising coming from such a compact light. It effectively combines the intensity needed for distance with the spill needed for area lighting. The bright hotspot was expected but I was very surprised that the E2DL Ultra produces a broader beam than even some XML based lights such as the SureFire Fury and Malkoff Hound Dog. The following slides show the E2DL Ultra beam compared to a variety of other lights. The beams can be compared across the full width of the image using the slider, while additional images can be accessed by using the navigation buttons in the bottom-right corner. When run continuously, the E2DL Ultra maintains its initial level of output for only a couple of minutes and then begins a decline over the next 8 or 10 minutes down to about 70-75% of its initial output. It holds that level fairly steady for the next 80 minutes until it drops out of regulation and begins a long taper in output over the next 30 minutes. Finally, near the 140 minute mark, the light began flashing and I ended the test soon afterward. The E2DL Ultra is a versatile light that projects effective light well over 100 yards but also provides enough spill to illuminate the general area. Its compact size and 2-way pocket clip allow for a variety of EDC and usage options. Good runtime (although at less than full output) with long taper as batteries become depleted. Addition of 2-way pocket clip – one of the best in the business. Parts compatibility with other E-series lights. Trademark aggressive styling of the Defender lights is not acceptable or appealing to everyone. Only maintains initial output for a short time. One of the most interesting things about the E2DL Ultra is the hint it gives of other possibilities such as future conversion heads, perhaps a 500 lumen KX2C replacement, which could be used on other E-series lights. The Ultra’s head fits and works perfectly (EDIT: it works almost perfectly, see comments below) with the LX2 body and 2-stage tail switch, evoking thoughts of the LX2 Ultra, which did not make it into production. A non-crenelated bezel combined with the LX2’s tail switch would be a winning combination. SureFire are you listening? The Ultra is compatible with SureFire’s F04-A Diffuser, F05-A Red Filter, and F06-A Blue Filter. See these attachments in action in their mini-review. For similar styling in a smaller package, be sure to check out our review of the SureFire E1D LED Defender. A single-cell 300 lumen pocket rocket! 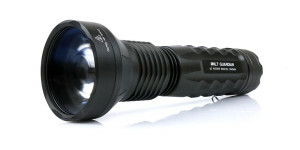 Additional information on the E2D LED Defender Ultra can be found on the SureFire website. Share your thoughts and feedback in the comment section below. 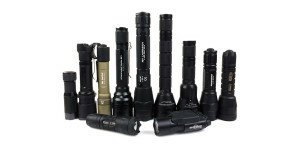 Have you ever wanted to know what goes into the production of SureFire flashlights? 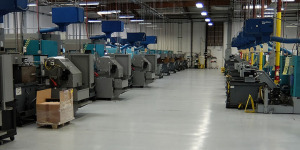 Check out our exclusive Behind the Scenes look at the SureFire machining and production facilities in Orange County, California. 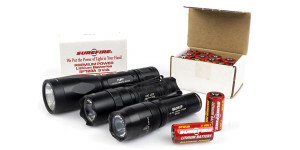 Posted in Flashlight Reviews, SureFire Reviews and tagged LED Flashlight Reviews, Surefire. GREAT REVIEW!!!! Thanks! So did the light function properly on the lx2 body? Did it have a low output when you slightly pressed the tail cap and then high when you full pressed the tail cap? Yes, the E2DL Ultra head worked just like the LX2 head – Slight press = low, full press = high. It appears that the electronics in the Ultra’s head are set up similar to the EB1 and allow operation with either a click type switch (high mode first, followed by low) or with the 2-stage momentary switch like on the LX2. Awesome very thorough review. Looks very professional and great photography and comparisons. Quick question: What is the beam intensity (candela)? SureFire literature lists it at 16,000 candela. I just did a quick test from 5 meters and measured 606 lux which would be 15,150 candela (lux @ 1 meter). The batteries were slightly used so I would say SureFire’s rating is pretty accurate. Great review, how far is the light from the bench out side? Thank you. It was 30 yards to the swing. The bench at the 2:00 position would be about 27 yards. Wow thanks for the fast response! Again hands down best flashlight review I have ever seen… And Iv seem ALOT! Haha. Keep up the great work! Does the head fits the m600 scout lights? I tested the head on other E-series lights and I can verify that it fits and works fine. I do not have a Scout light but it uses the same design so it should work as well. While testing a floor model, I noticed the tail switch needs to be pushed in quite far for signaling (flashing) someone. I use my flashlight alot for this …. I was curious if it was just the light I was testing or is this the case with the model itself. Can the tailswitch be replaced with a more sensitive one from another light ? While not exactly a hair trigger, the tailswitch activates with only a small amount of movement. Prior to seeing your question I considered it to be exactly the same as any other E-series clicky I have. After looking at it more closely, it might have slightly more space between the boot and the switch, maybe requiring a tiny bit of additional movement when compared to my older E2DL, but the difference, if any, is so small as to be insignificant (to me at least). By no means do I consider it needing to be pushed in “quite far” for activation but that is pretty subjective. As far as replacement is concerned, the tailcap from any other SureFire E-series light (with the exception of the EB1) can be used on the E2DL Ultra. Also, although I have never tried this, I believe I have read that a McClicky switch can be made to work in the tailcap with some minor modifications. “The Ultra’s head fits and works perfectly with the LX2 body and 2-stage tail switch” – Someone on CPF said that every other full press yielded the low mode… if that is the case then it doesn’t work perfectly. In your experience does it work exactly the same as the LX2 UI with the normal head? I probably should have worded that as “almost perfectly” and, in fact, I believe I will update the review to say so. A partial press always results in low mode, regardless of how rapidly the switch is depressed. From low mode, a full press always results in high mode, regardless of how rapidly the light is cycled. It should be noted that I did get a little bit of a flash a couple of times when rapidly cycling from OFF-LOW-HIGH but I’m not sure if that was due to the head, the switch, or my thumb protesting the effort. If the light has been off for 1 or 2 seconds, a full press will always result in high output. I appreciate the question and hope this helps. Would you happen to know or have measured the E2D Ultra’s CRI rating? Just wondering how titnty this emitter is…. I’m afraid I have no way of measuring the CRI of the emitter and I have seen no information about it. I can only offer a purely subjective opinion on color rendering. The center of the beam strikes me as cool but with fairly decent color rendering. When projected on a nearby surface, the corona around the hotspot has a very noticeable greenish tint. The overall beam has a slight greenish tint but it is the corona that really stands out. When illuminating targets at distance, the greenish tint is still present but is not as noticeable unless directly comparing it to another light. Probably the best example of this is in the outdoor beamshot comparisons above when comparing it to the Malkoff Wildcat. If I were spending my time illuminating white (or lightly) colored rooms or garages with the light, the beam tint (particularly the corona) could be a little distracting to me. However, when using it outside or at a distance, I don’t even think about it. Thanks for the question and just remember this is only my own opinion based on one sample. Your results (or opinion) may be different. To my knowledge, the letters only indicate different versions. This could be the result of a running change or upgrade (where “B” supersedes “A”) or it could be a case where both versions are produced concurrently with different features or specifications. This gets really fuzzy when you’re talking about some model numbers for complete flashlights. For example, the 6PX-C and 6PX-D are basically the same light, with the same LED, and have the same maximum output. The only differences are the tailcaps and the 6PX-C has only one output mode (high only) while the 6PX-D is a two-mode light with high and low outputs. I have no experience with the V1 Vampire or a “B” head for the Defender so I can’t comment on any potential differences. Yes that conversion head idea would be nice. Would love to just get a 500 lumen head for my old e2dl instead. This flashlight will work fine with 18650/17650/16650?